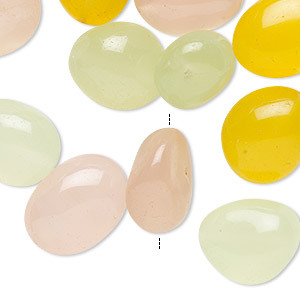 Bead mix, agate (dyed), pink / golden yellow / light green, small to large hand-cut nugget, Mohs hardness 6-1/2 to 7. Sold per pkg of 10. 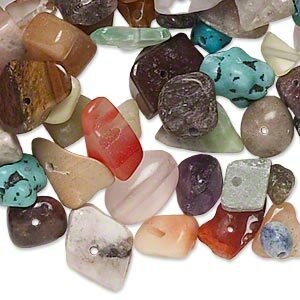 Package features tumbled smooth and polished agate nuggets. 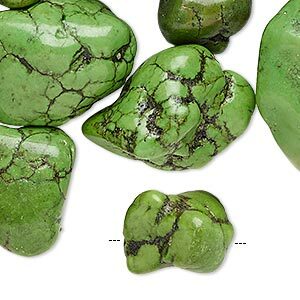 Pitting under polish is a natural characteristic of the stone. Sizes, shapes and colors may vary with handcrafted items. 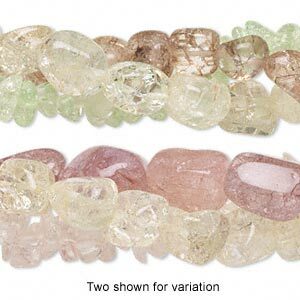 Bead mix, multi-gemstone (natural / dyed / imitation / stabilized), mixed colors, large chip and mini to large nugget. Sold per (10) 15" to 16" strands. 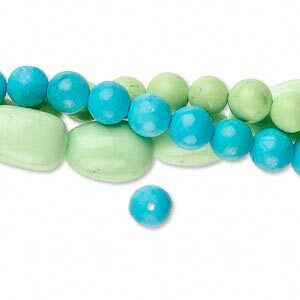 Bead mix, magnesite (dyed / stabilized), blue and green, 4-6mm round and small to medium nugget, Mohs hardness 5. Sold per (3) 15" to 16" strands. 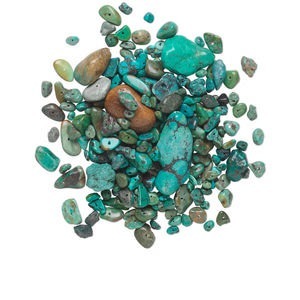 Bead mix, turquoise (dyed / stabilized), blue-green, large to extra-large chip and small to large nugget, Mohs hardness 5 to 6. Sold per 25-gram pkg, approximately 20-30 beads. 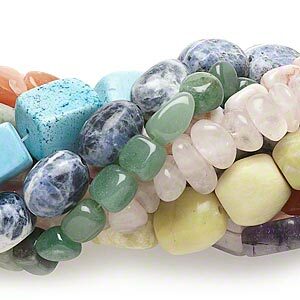 Bead mix, magnesite (dyed / stabilized), apple green, small to extra-large nugget, Mohs hardness 3-1/2 to 4. Sold per 1/2 pound pkg, approximately 30 beads. 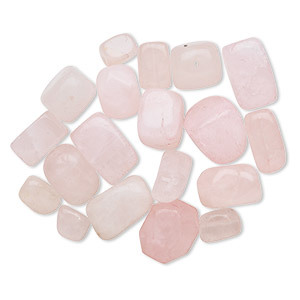 Bead mix, rose quartz (natural / dyed), small to large nugget and 11x7mm-22x20mm rectangle, D grade, Mohs hardness 7. 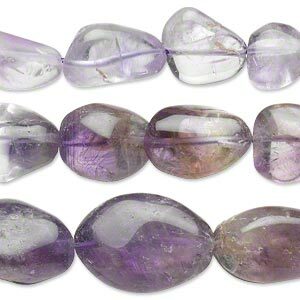 Sold per 1/4 pound pkg, approximately 15-25 beads. 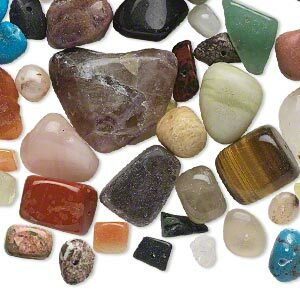 Bead mix, multi-gemstone (natural / dyed / manmade / imitation) and glass, mixed colors, small to large tumbled nugget. Sold per 1/4 pound pkg, approximately 45 beads. 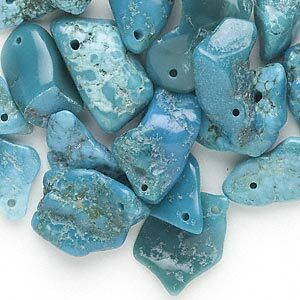 Bead mix, turquoise (dyed / stabilized), blue, small to gigantic chip and mini to extra-large nugget, Mohs hardness 5 to 6. Sold per 1/4 pound pkg, approximately 70-180 beads. Bead mix, multi-gemstone / mother-of-pearl shell (natural / bleached / dyed / manmade / imitation) / glass, mixed colors, mini to extra-large chip and mini to small nugget. Sold per 1/2 pound pkg, approximately 600 beads.